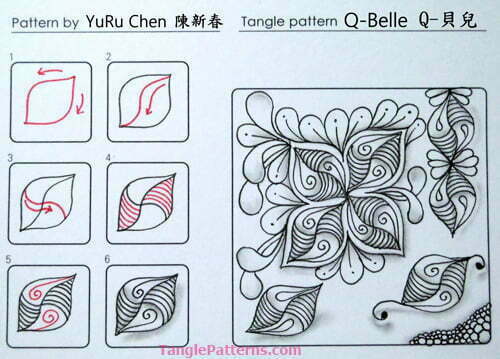 Taiwan tangler YuRu Chen is back today with another lovely tangle, Q-Belle. This is her seventh tangle on the site. 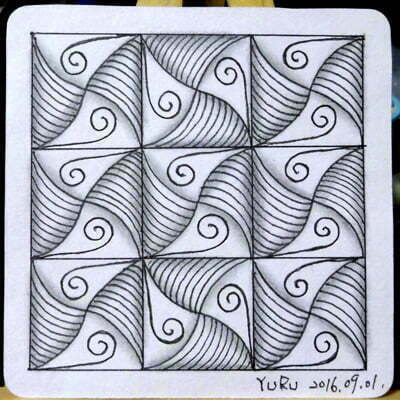 YuRu writes that she was practicing “painting leaves change … and inadvertently drew this pattern“. Formed with a simple leaf shape that can be combined in many different ways, Q-Belle is an easy tangle with a pretty end result. As usual YuRu’s examples of Q-Belle provide lots of inspiration for ways to use her tangle. YuRu illustrates the step-by-step instructions for drawing Q-Belle below with a completed Zentangle using the Zentangle-original Flux together with some Mooka and Tipple. 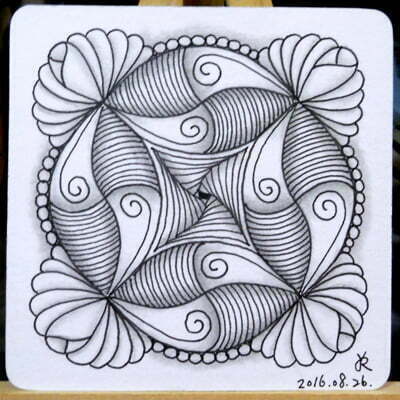 In this lovely Zentangle tile YuRu demonstrates how well Q-Belle works as a grid-based tangle. 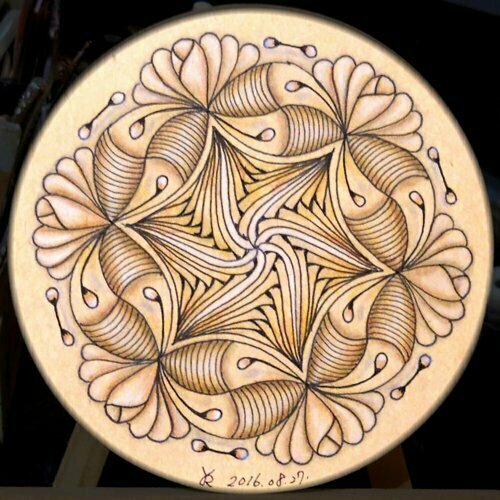 In this Renaissance Tan Zendala, Q-Belle forms a circular border around the Zentangle-original Betweed with a Fengle-inspired twist. And in this last example with a Zentangle-tile, Paradox is the focal point of four large Q-Belle elements. Donna, I love your last name! YuRu…this is gorgeous! And your tiles drawn with other tangles are so beautiful. Maybe one day I can produce results like yours. I’ll never stop trying! Thanks for this tangle! YuRu, this is such a BEE-YU-TIFUL tangle and I just love the variations you have shown us, especially how nicely the Paradox slides into the Q-Belle in the middle of the Zendala one! I know I`m going to enjoy playing with this one! Thank you so much for contributing it! This is nice and love the way you used it on your tiles. This seems very flexible for lots of applications. Thanks for sharing. Thank you; I did zentangle while my mother was dying. Have not looked at it for awhile, and want to get back to it. Interesting tangle and gorgeous tiles. Love! Thanks so much. So many ways to use this and so pretty.